Welcome to Denver Pavilions. We hope you enjoy your stay in the Mile High City! Denver Pavilions is located in the heart of downtown in an easily accessible area for parking, 16th St. Mall free shuttles, RTD public transit bus lines, RTD Light Rail stations, and a B-Cycle ride sharing station. 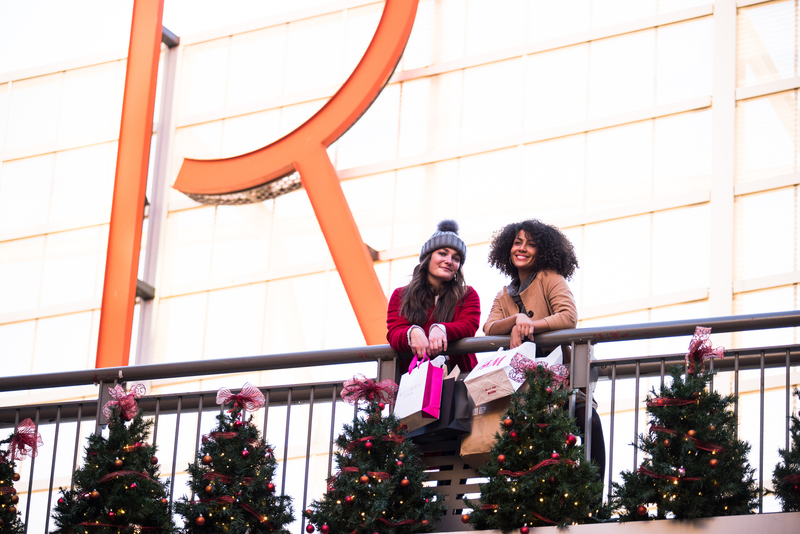 Denver Pavilions is downtown’s number one location for shopping featuring national brands and locally-owned boutiques. The Center is also the perfect place for grabbing a bite with friends and family or hosting a corporate lunch at one of our ten eateries. It’s date night and there is nowhere better to go than to Denver Pavilions! With a movie ticket purchase from our newly remodeled theater, you’ll enjoy 4 hours of free parking in our underground garage. That’s plenty of time to dine at one of our restaurants, catch a flick and park for free! If you’re at Denver Pavilions, then you’ve found the #BestViewofDenver. Get your Denver selfie in front of the iconic Denver sign on Level 3. Find the red arrow showcasing the best view next to Lime Cantina on Level 3. Catch a free ride on RTD’s 16th Street Mall Shuttle. Easily access Denver Pavilions via the free mall ride operating on the 16th Street Mall. Stops on Welton Street, Glenarm Place and Tremont Street will conveniently place you directly in front of Denver Pavilions. RTD’s Light Rail system delivers you within blocks of Denver Pavilions. It’s a hop, skip, and a jump when you use RTD’s Light Rail service to downtown Denver. Stops at Union Station and California Street are within easy walking distance to Denver Pavilions. Not in the mood to hoof it? Take a free, quick ride on the 16th Street Mall shuttle to get to Denver Pavilions within minutes. Denver Pavilions offers approximately 800 underground parking spaces accessed off Welton Street and 200 surface parking spaces accessed off Glenarm Street. The retail/entertainment/restaurant center is convenient for the downtown area’s 110,000 office workers and is close to all the major hotels, the convention center, the 16th Street Mall shuttle, RTD buses, light rail service and B-cycle stations. Saturday & Sunday enter by 5am, exit by 7pm. * Vehicles leaving after 5am will incur day rates. * Vehicles leaving after midnight will incur evening rates. Evening rate is $7.00. Lost ticket fee of $45. No in & out privieges. From I-25: Exit Colfax Ave. East. Cross Speer Blvd. and first left onto Welton St. Then cross 15th St. to Denver Pavilions. Underground parking entrance on right. Parking Garage: Denver Pavilions Parking Garage — accessed from Welton Street between 15th and 16th St. Elevators take you directly into the Denver Pavilions from the parking garage. Metered street parking available around the Denver Pavilions — free on Sundays. Free shuttle on the 16th Street Mall. UNITED ARTIST THEATRE ON LEVEL 3 IS THE ONLY MERCHANT AT DENVER PAVILIONS THAT VALIDATES PARKING. PARKING WILL BE VALIDATED FOR THE UNDERGROUND GARAGE. THE ENTRANCE IS LOCATED ON WELTON BETWEEN 15 STREET AND 16 STREETS. THE THEATRE WILL VALIDATE YOUR PARKING FOR 4 HOURS. TIME BEGINS WHEN YOU ENTER THE GARAGE. Denver Pavilions’ underground garage is brightly lit, complete with directories and a color-coded way finding system for patrons to navigate to their destination quickly and efficiently. The garage is patrolled by security. The “Park Now” program includes garages that offer the most benefit to customers.